Winter can be an exhilarating time, with holiday festivities at every turn and an invigorating chill in the air. But it can also be a time of stress, illness and an increased urge to eat, drink and stay in bed. You’re not a bear, and this isn’t the time to hibernate. As the year comes to a close, look and feel your best by following these three lifestyle strategies.Keep Moving. Remember, winter days are the shortest of the year. Less sun can cause you to feel glum. So what can keep you feeling chipper? That’s right, endorphins. Exercise delivers a myriad of physical and psychological benefits, and it’s a great way to keep your mood lifted during this time of year. 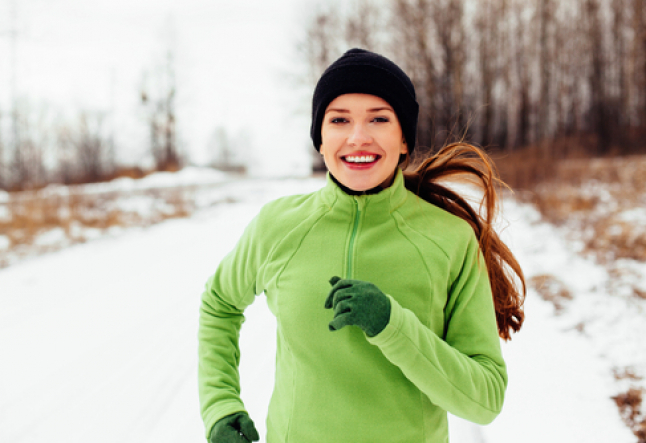 If running outside in the cold weather does not sounds like an option, get creative with your routine. Join a gym or a yoga studio and enjoy the motivation of working out alongside others. You can bask in the heat, improve your fitness and clear your mind—all in about an hour. With cold and flu season in full swing, winter isn’t the time to slack in the nutrition department. Load up on fruits, vegetables. And just because it’s not hot outside, don’t stop drinking plenty of water. Stay hydrated with good old H2O and coconut water, or sip some hot water with lemon for an extra cleansing beverage. How do you handle all the indulgent food and drinks at holiday parties? A simple and effective strategy is to track your calories with an app like MyFitnessPal. If your calories (and the quality of those calories) are reasonable 90 percent of the time, you can have fun and indulge a little that other 10 percent of the time. Feeling good inside, will help making you look good for the parties you’ll be attending! Stay on track with your nutrition now and enjoy slipping on those new dresses, instead of dreading them. Also, the new year is around the corner; think of how many New Year’s resolutions about weight loss you won’t have to make if you keep yourself in check now. And most of all, a healthy body is a happy body. So make health your top priority, and the image part will fall into place. Even though it’s tempting to stay bundled in loose, warm clothing, be careful not to get sloppy. Give the hoodie and sweatpants a break and get ready every day—even if that means pulling your hair into a ponytail and swiping on a little mascara. Put some thought into layering a cohesive outfit so when you step out of the house, your suede leggings complement your knit cardigan and statement designer handbag. You’ll feel on top of the world whether you’re doing a quick coffee run—or running into your ex-boyfriend. As the temperature continues to drop, don’t let your spirits follow suit. If you embrace it, winter can be a time of family bonding, holiday gatherings, romance and excitement. So keep your body moving, dial in your nutrition and continue to put effort into the heart you’re showing the world.